In the wake of today’s environmental concerns, we’re ready to step up as an educational resource for businesses and individuals looking to improve the operational efficiency of their irrigation water supply and distribution systems. A New Responsive Design: Smartphones aren’t just a consumer phenomenon—our irrigation customers use it, too! Get all of the information you need regardless of your device preferences. The New Knowledge Center: We have a deep library of video tutorials and explanations that we’d like to share with our audience. The Knowledge Center on the new website gives you direct access to all of the YouTube videos we’ve created. A Dedicated Tools Section: Whether you’re a project manager, a farmer, a dealer or an irrigation designer, this new section of the website will help you coordinate the tools you need for any job. 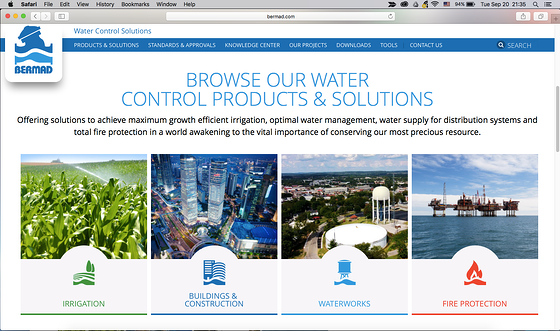 The BERMAD Irrigation World: It’s one thing to present a list of BERMAD products and their specifications—it’s another to surf a virtual environment where you can see how our applications and solutions work together to improve your irrigation and water works infrastructure. The BERMAD Irrigation World helps you visualize your own challenges and shows you how to solve them. Whether you want to learn more about a specific irrigation issue or find products and solutions to fix a known problem, our new website and blog are here to help you. Subscribe to the blog today to keep up with the latest educational content, and industry news to help you solve your most frustrating irrigation challenges. In the meantime, explore our new website and see how we’re continuing our mission as a world leader in our industry.